Beautiful 3D graphics, more choices involved in game play and iconic style. One of the best Legend of Zelda games in the past decade. Head back to Hyrule in this fantastic game packed with plenty of nostalgia. Released almost exactly 22 years after it’s predecessor, The Legend of Zelda: A Link Between Worlds is without a doubt one of the best instalments of the series in recent years. For the first time in the series, Nintendo have changed Hyrule history and released what can be seen as a direct sequel to A Link to the Past. The Legend of Zelda: A Link Between Worlds has breathed new life into both the series and the 3DS itself. As the first original Zelda game for the console, it really does nail it. 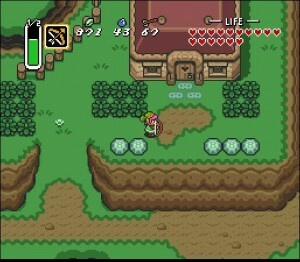 Whilst set quite some time after A Link to the Past, players are brought back to it’s classic version of Hyrule. The game sees Link’s new enemy turning Hyrulians into paintings and transporting them to a dark dimension, Lorule. With the help of a new character Ravio and his magical bracelet, Link is able to transform himself into a two-dimensional painting and move along walls and between the two realms. This entirely new concept in the series allows for a totally original approach to tackling dungeons and an array of new puzzles, arguably the most difficult encountered in a Zelda game so far. Along with the addition of Link’s ability to move along walls, there are other welcome new features in the game. One of the biggest changes is that players are able to tackle the dungeons in any particular order of their choosing through the addition of the new character, Ravio. This odd little fellow appears at Link’s house looking for a place to stay. Not only does Ravio give Link the bracelet which allows him to become a 2D image, but he also has the items needed to access the dungeons. Ravio loans Link the item, which must be returned if your life meter runs out at any point in the game. In previous games if your character ‘died’ you would merely be transported back to a checkpoint or dungeon entrance. Not this time. If Link’s life meter runs out, you will be transported back to the house and Ravio will have taken the item back. Now, he offers the first loan for free, but after that he will charge silly amounts for giving an item back. Whilst this does make things a little more difficult, it means that all those Rupees found through endless grass cutting and beastie bashing actually worth acquiring. The enemies and items encountered along your journey are recognisable from previous games, as are some of the dungeon layouts. However, Link’s new ability to become a 2D drawing completely turn dungeon tackling on it’s head, making new challengers for seasoned players. One of the best features about A Link Between Worlds has got to be the stunning visuals enabled by the 3DS. Hyrule has never looked so pretty and the characters are very well designed. The game finally feels like something worth playing in 3D and Nintendo have definitely not disappointed here. The graphics are beautiful, with seamless 3D and they’re a great modern homage to the classic games. The 3D graphics are elegant and comfortable, not just in your face and headache inducing like in some of the other 3D games out there. Princess Zelda, looking even prettier than ever before. It’s quite simply gorgeous gaming and a must have for any Zelda fans out there, or those looking for a decent 3D game. After some of the more recent games in the series, Nintendo really have upped their game. They’ve completely revamped it and thrown in some great new features, whilst keeping Zelda’s classic style at it’s core. There have been some great releases this year for other consoles, but it looks like with the release of Pokémon X and Y last month and now this, Nintendo are finally back in the game, doing what they do best. The Legend of Zelda: A Link Between Worlds is most definitely my game of the year and will certainly keep me heading back to Hyrule for more. I'm an aspiring film journalist living in Chester. Into all kinds of geekery from N64 to Xbox, graphic novels, cosplay anime and more. I have an unhealthy obsession with Pokémon and the Legend of Zelda series. So much so that I have two Zelda tattoos and various Pokémon lurking all over my house. In my spare time when I'm not busy being a real person and working, I'm writing or making retro games jewellery. I'm also obsessed with pandas. They're fabulous.